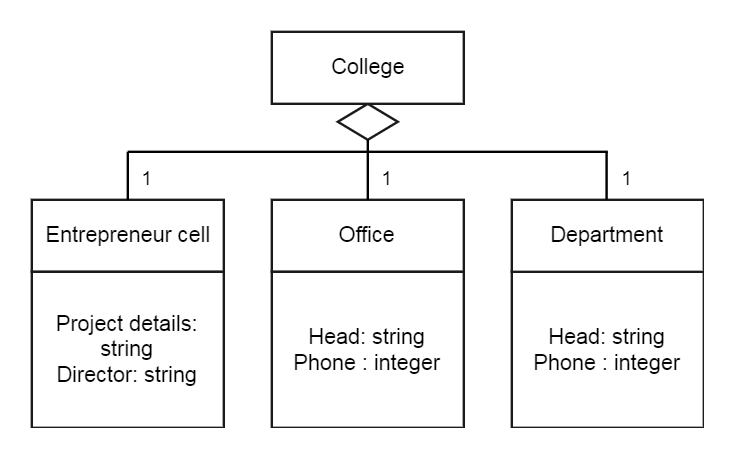 Let take an example of a college class which composed of classes like department, office. So we can say that department is a part of college. 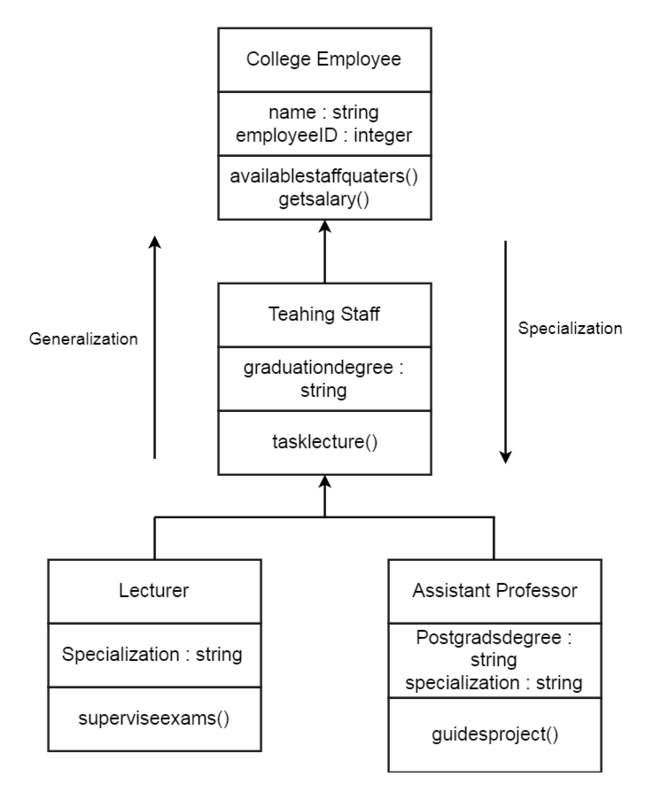 Following figure represent aggregation hierarchy where college is aggregate class. Aggregation specifies “has a relationship”. So college has a T&P department. Generalization is type of parent and child relationship between the classes where child inherits attributes of the parent. Generalization and specialization represents inheritance relationship. A class get generalized when we go upward from child to parent. It provides a standard for communication between client and service. It provides foundation for communication for service oriented architecture. 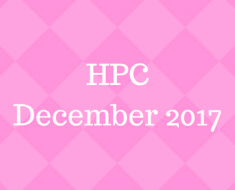 It is used in distributed environments. SOAP message contain an envelope which describe the message, an encoding rules for sender and receiver with data type description, also convention for representing response message and remote procedure calls. Fig. 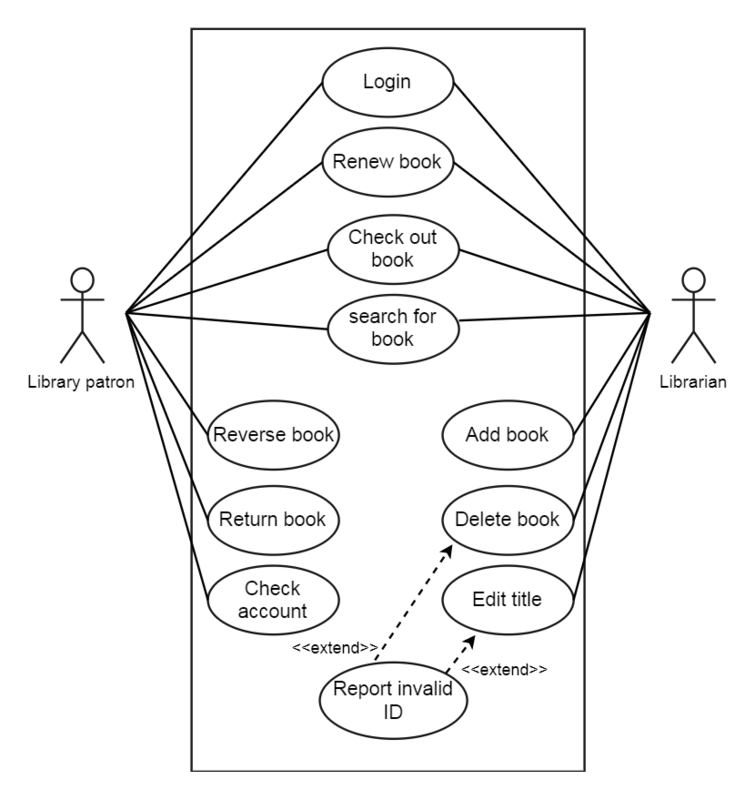 Use case diagram for online digital library system. The main aim is to abstract the instantiation process. It is applied when system is in dependent complexities of object creation and representation. Abstract factory is type of creational design pattern which provide an interface for creating an object that are independent. When primary concern of design is to compose large structures from classes and objects, then structural design pattern is used. It uses inheritance to compose interfaces. Proxy is a type of design pattern which is used as place holder for another object that controls the access to main object. The main aim is to assign algorithms and responsibilities to objects. It used to describe class, objects and their communication. It describes the control flow at runtime between objects and make easy to understand the interconnection of objects. It is a process of implementing the software. Design process is important in software development which results in better design and lead to a successful product. It is an initial step towards the solution with available capabilities. In singleton pattern, only one instance of class must be created and which can be used as global point of access. In this, class is responsible for instantiating itself. In this, a class ensures that only one instance of class is exists by keep tracking itself. Thus, a special operation allows user to access the unique instance. There is no any collaboration of classes for accessing the singleton instance. User access the instance from well-defined access point. If any other instance is present and class get request to instantiate itself again then it reject the request. For example, there should be only one instance of antivirus scan is running in system. 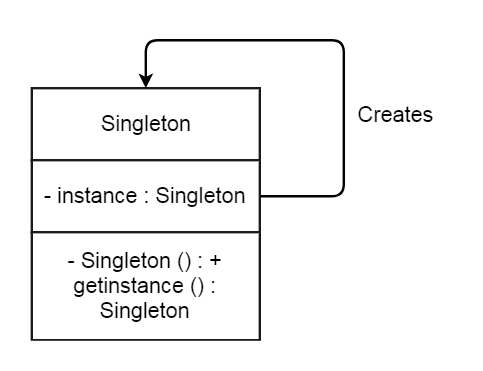 Singleton patterns are used to implement log manager class which gives global logging access to several components of application. There should be single instance of log manager which allows only one components of system to print its log at a time. Software architecture views cover different aspects of system that implemented and also look it from different way. Logical view: It is related to functionalities offered to end user of system. Module can be represent by sequence, class and communication diagram. 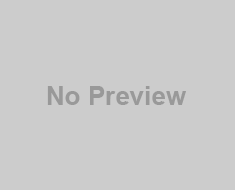 Development view: It is also called as component design view. This is the developer’s view who contributes in project development. Module can be represent by component and package diagram. Process view: It is related to runtime aspects of the system which describe program structure at runtime. It also deals with concurrency, performance and scalability. Module can be represented by activity diagram. Physical view: It is system engineer point of view and related to deployment, administration and environment of system. This view represents tools and its interaction, supporting software. Module can be represented by deployment diagram. 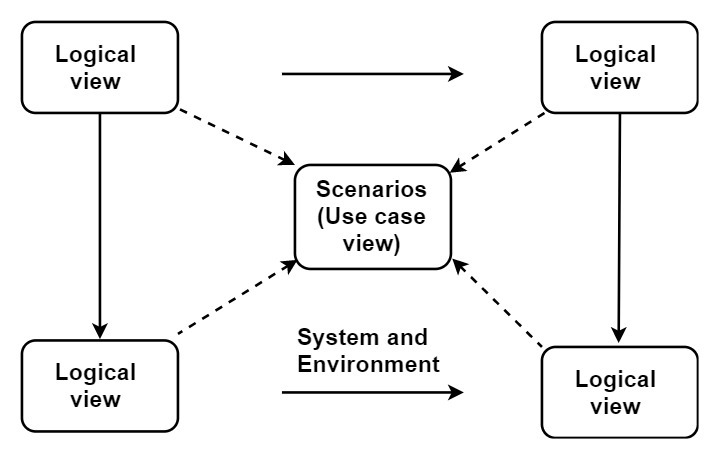 Scenarios: Scenario at the centre represents fifth view which refers as use case view. Conceptual view: Primary design elements are described in this view. Module view: It describes module and its interaction. Execution view: It describes run time, concurrent execution perspective. Code view: It describes structure of source code and their classification into objects. Real time software system has to handle multiple streams of inputs and need to respond quickly during its operation. They are concurrent architecture where system is structured into concurrent tasks and are state independent. It describes interfaces between concurrent tasks and interconnection between the concurrent tasks. The system need to be designed carefully. It is a combination of real time operating system, application, input/output etc. The system has multiple inputs and output and need to handle concurrently. They are concurrent systems and have time constraints for operations. Real time systems are complex system. They produce multiple independent results for multiple independent inputs. Real time system contains special purpose device drivers which can be connected to sensors and actuators. Real time system contains real time input and output system with real time operating system and real time applications. The time of data arrival is not known and load can be varying at different times, thus the system is unpredictable. Soft and hard real time system requires different design strategies. 8. It is related to quality control. It is related to quality assurance. Defects may contain a fix pattern and may occur in clusters so the testing should be aimed to find out such pattern and should focus on clusters. Testing includes measures for defect prevention and one cycle of testing result in improved version of software. Test engineer should not always with fixed framework of testing. They need to think differently for designing test cases. Defect is a bus or error in software system which causes the system to produce incorrect result. Sometime defect may not detect for long time during system operations. Thus, testing helps to detect the defects in the system which being developed or already developed. It is used to identify errors at boundaries rather than existing in middle of input domain. Most of the errors occur at the boundaries of input domain. It is next step of Equivalence partitioning for designing test cases and these test cases are selected at the edge of equivalence classes. Values that are below the edges of input are 0 to 999. Values above the edges of input are 2 to 1001. 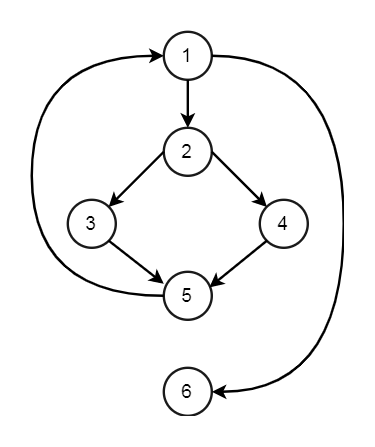 Q7) c) For the given piece of code, draw flow graph and compute the cyclomatic complexity of the same. 1. It is conducted within the organization. It is conducted at the client’s place i.e. outside the organization. 3. Alpha Testing is not open to the market and public. Beta Testing is always open to the market and public. 4. This testing is conducted in virtual and controlled environment. This testing is conducted in real time or live environment. 5. When the development of software is near to completion stage, Alpha testing is conducted. After passing Alpha testing and before the final release of the software, Beta testing is conducted. 7. Developer is present while testing so he records all the problems and errors occur during testing. Customer records all the errors and other issues occur during this testing and reports to the developer. Any of black box, grey box, white box testing methods are used in integration testing. It describes the testing of top most interfaces first and other component interfaces are tested in top to bottom order. For example, component 1 and 2 are available, so interfaces between those are tested. Testing starts from bottom and takes the bottom-up approach. In this testing, top-down and bottom-up approaches are combined. Components 1, 2, 3, 4, 5 are tested individually by using drivers and stub. When all the components are integrated and tested together as single unit, then it is called as system integration testing. It further classified into components and system integration testing. The testing which tests the entire system as an integrated component, instead of testing each unit one after another, such testing is called as big bang testing. Such type of integration is called as big bang integration. It is perfect for system development where there are less number of interfaces detected with defects. When most of the interfaces and components are already available for testing then this testing is suitable to perform. 1. It is performed before non-functional testing. It is performed after the functional testing. 2. It is easy to define functional requirements. It is difficult to define the requirements for non-functional testing. 3. It is based on customer’s requirements. It is based on customer’s expectation. 4. It helps to validate the behavior of the application. It helps to validate the performance of the application. 5. It describes what the product does. It describes how the product works. 7. 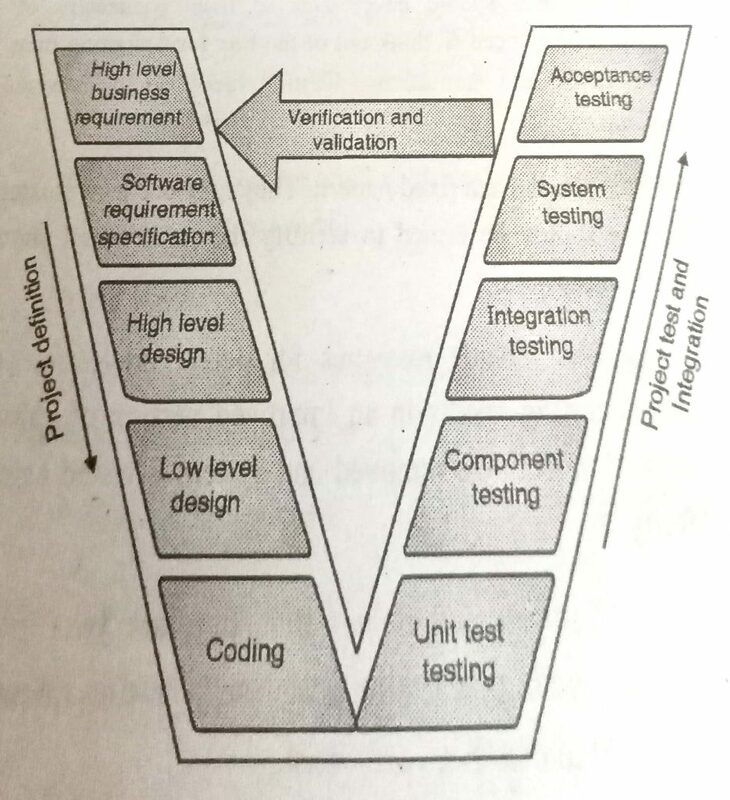 It is carried out to validate software actions. It is done to validate the performance of the software. 8. Manual testing requires less cost than automation. Initial cost of automation testing is more than manual testing but useful always. 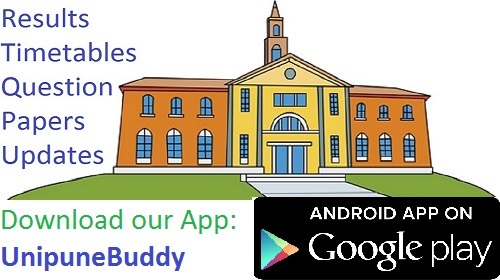 Application developed for mobile platform is tested for its performance, security, functionality. Testing can be performed manually by tester or developer and by using automation testing tools. Comparing with desktop application, mobile applications testing contain many challenges and most of them not been addressed properly because of increase in growth of mobile applications. There are wide range of mobile devices with different platform are available so the testing on any one device does not guarantee that application will run smoothly on other device. Diversity in OS and platform such as iOS, Symbian, Blackberry, Android etc. forces organization to develop their application for all platforms. Therefore different test cases and strategies need to be designed according to the platform. No of mobile operators is large which influence the development of mobile application and testing. Support for script and its elements differ from one platform to another. Devices may contain different configuration which results in different test script. Effort and resources of testing are minimized at product development stages.